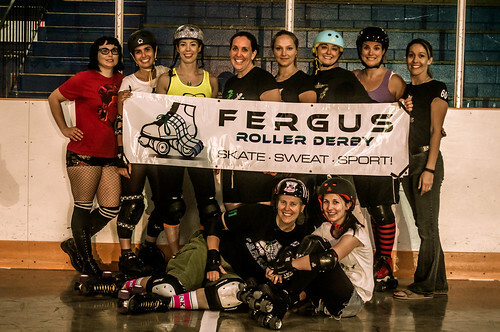 In another one of our random recounts of Derby journeys we recall a trip up to Fergus in the middle of December. 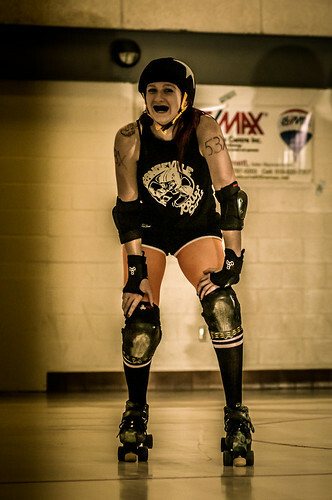 It would turn out to be our last Derby bout of the year 2012. It was a grey December day, and a bit of precipitation was in the forecast. The windshield wipers to the Psychomobile were in full use as the wheels hit the highway. Once we were beyond the Guelph, it became farmville country. Stalks of dead and harvested corn lined either side of the two-lane either side country road. Lo! and behold the road quickly became shrouded with the densest of grey fog. It was a scene out of a John Carpenter movie, [the original, not the Smallville remake] and we let Psycho know it. She told me to stop saying it. Nevertheless, it was still eerie out there à la Children of the Corn. Shrouded car lights were all going the other way in the murk. Maybe they were telling us something. Psycho stopped off in a garage to replenish the water for the wipers that had run dry in the rain. One could feel a Silent Hill ominousness as the crows looked down from overhead telephone wires. Driving through the desolate farmland was left behind as vestiges of civilization began to appear. Lo! the highway sign: Fergus, population 1. The Wellington Sportsplex looked to be shiny and new and very reminiscent of the type of building in Ajax where the Durham league dwelled. There was a pool for Psycho to splash around in if she had a Gore Gore uniform. Knocking on the doorway to what could have been the room for the bout, we were quickly welcomed and ushered in as game time was right on the horizon. All the requirements for power were available around the walls. Game on! rock and roll and ready to shoot. So what was the atmosphere like? This was derby baby at the grassroots level. Jam-packed crowd. Jam-packed derby. First time announcer, first time fans. Demo 101. Trying to explain the rules. Just a lot of fun and a mixture of sprawls and lots of big sprawls. But were the players ready? The crowd certainly was, many at their first ever bout. Seats were set up behind the suicide lines. Much of the crowd from out of town cheered for their Orangeville team. The room was no bigger than a church basement just able to accommodate the track itself. There was even a stage set up with seating to hold part of the crowd. 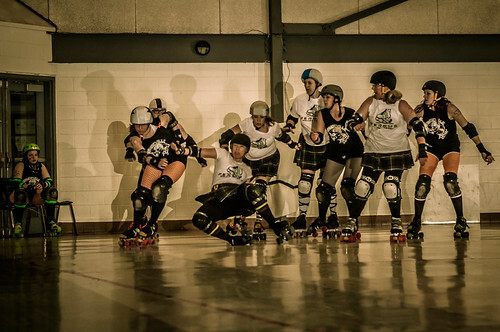 The narrowness of the room meant there was barely any outside track space separating the skater from the wall or the exit doors. Padding was taped to the walls as best as they could. 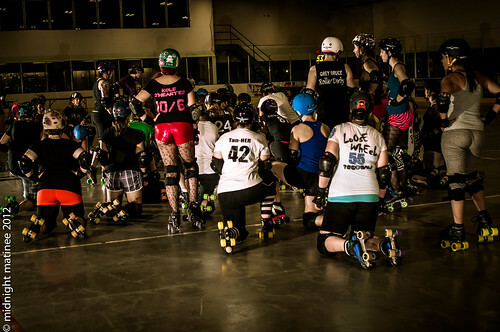 The teams were herded and huddled around the inside of the track. Even the zebras were confined to the inside, the head ref, jam refs obviously, but all the OPR were on the inside, producing quite the cluster. What were Psycho’s impressions of what she saw that day? There is a spring and summer full Fergus schedule to be announced later. 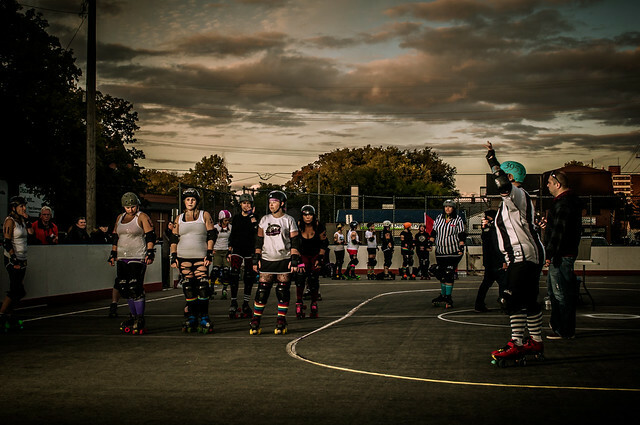 Intro: It was as unlikely an introduction we were to ever have to the life of a Derby lady. Out of the blue [through the facebook event page], Tracey Tanner offered me a ride up from Toronto to the outdoor scrimmage to celebrate Pride Week in Peterborough as hosted by PRD (Peterborough Roller Derby). Along the way, Tracey Tanner was not just a congenial driver, she was a gracious host and offered thoughtful responses to my questions about Derby, and she added fascinating details of her life in Derby and outside. Finally, we made it up to Peterborough and the park which was filled with longboard skaters occupying the rink before game time. The calendar of events called it a Special Pride Week Exhibition Scrimmage (with “school yard pick of players from Peterborough, Durham, Lindsay, Northumberland, and Toronto leagues and beyond (including Alliston and Grey Bruce).” The time of the scrimmage made this unusual with its start time at 6:30 p.m. In September this meant playing and photographing in the golden hour and then rapidly dwindling daylight. In essence, this became an outdoor night bout. And with the oncoming of night meant the onset of cold temperatures. 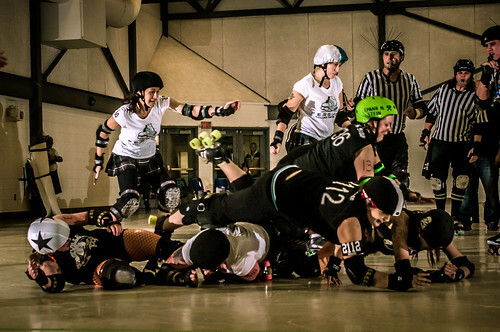 The Derby braved it out on the rough and cracked rink surface to show how Derby is played, tumbles and jams and penalties and all. One of the hardy ones from that night is the author and true voice of this unlikely story. Gentle Readers, ladies and gents alike, here is Tracey Tan-HER. 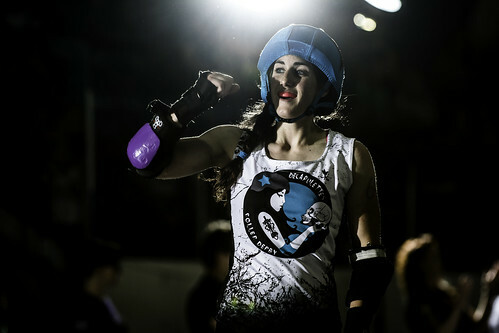 The Most Unlikely Derby Girl. y co-worker, and voice of reason, thought I was off my nut. I had just returned from work after a two month sick leave because of an unfortunate motorcycle accident that broke both my wrists. 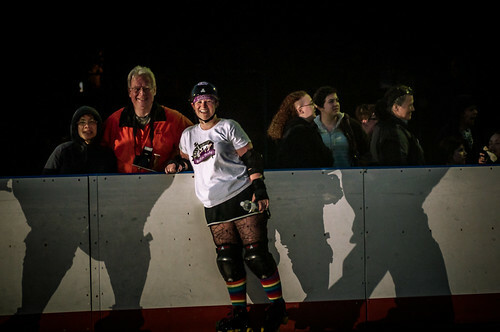 I was overweight, out of shape, and hadn’t been on roller skates in 30 years. Yet, I could hardly wait until a decent hour to call the telephone number to find out about the upcoming fresh meat class. I’m 42 years old. I have never been athletic. In high school I was a mathlete. Currently I am a shift worker who works a lot of nights, so one night at work during the early hours I was cruising kijiji when I spotted an ad for a local derby team and I was immediately intrigued. Hours later when I finally made the call, I found out that the fresh meat classes were starting in four days. I drove off to Barrie (about two hours from home) the following day to buy a complete fresh meat package. I was told the cost would be around $200 to $350. The course itself would be another $130, including insurance. As I learned from the wonderful Rumbling Rage sales clerk (Renny Rumble, #1205 on CN Power, Smoke City Betties and Misfit Militia ) that as everything in life, one gets what one pays for. Because I was 5 feet two inches tall and close to 200 pounds, I needed more substantial skates. When I mentioned my recently busted wrists, I was advised better wrist guards were needed. I left spending slightly more than $500. 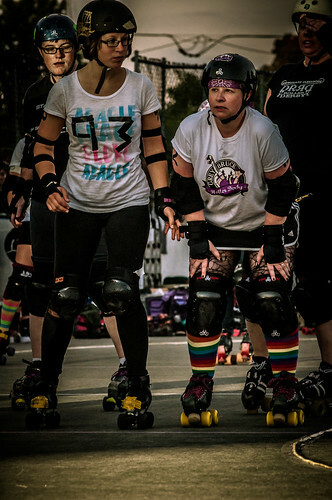 Never buy equipment from someone who doesn’t play derby—Renny has forgotten more about derby and equipment that I hope to ever learn and she was patient and extremely helpful. he first day of fresh meat was enlightening—I could hardly stand on my skates. Still, I was determined to soldier on. 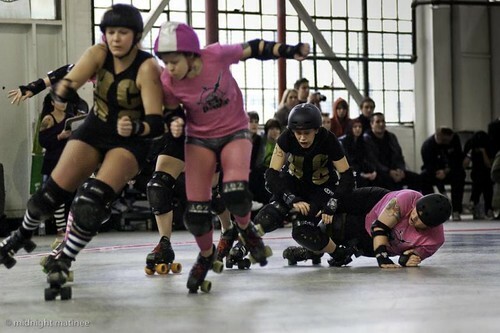 I had tried other exercise programs and always lost interest, but roller derby was far cooler than pilates or jazzercise. 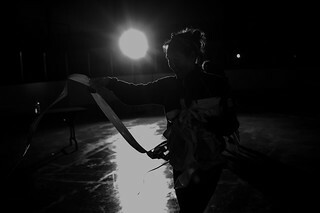 By my third practice, I felt comfortable on the skates. I remembered how to do the cross-overs on the corners, and the equipment gave me the confidence to be a little more daring. I discovered a local arena in Neustadt that still had roller skating on Friday nights (aka the “Land that Time Forgot”—they still play 80’s music there). Then came facebook and through it the connections, knowing the different leagues, the clinics with experienced players! Including Bonnie D. Stroir, Georgia W. Tush and Brimstone! A new world opened up! I have found scrimmages all over the area to attend and with each one I attend, I learn something new. he most surprising thing I’ve found is how gracious, friendly, and helpful the other participants are. I’ve played with so many players who are light years better than I am, yet without fail, when I ask about something, I’m given a thoughtful and detailed explanation. 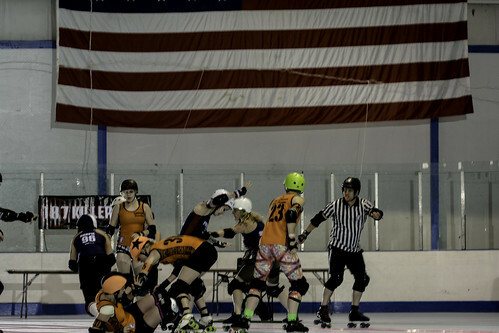 Derby is a difficult game to learn—the strategies, the skating, and the technical penalties all take time to get one’s mind around. Everyone seems delighted to share their knowledge and expertise. I have been at derby for 9 months now. I have suffered no injuries (knock on wood), but have had my bell rung a couple of times. It is empowering not to fall, but it is just as empowering to get blasted off the track and be right back in the thick of the action before anyone realizes you were gone. I have a collection of pictures of appalling bruises and scrapes that thrills me more than terrifies me. I am in better shape than I have been in years. Losing 45 pounds so far motivates me to do more cross training—not because I want to be thinner, but because I want to be faster and better on the track. 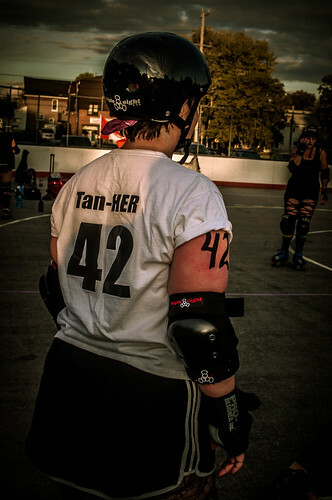 I lost so much weight that I had to replace everything except my skates and helmet, and now that I am getting better, I would like new everything again. Derby is definitely not cheap—my husband is going to freak out eventually. My friend, Joe Mac [editor’s note: who? ], asked me why I did not quit after one practice and the answer is the other fresh meat girls. I had expected a bunch of young, athletic, she-men with anger management issues. Instead, their age range was all over the place. Their professions and lifestyles had no pattern. 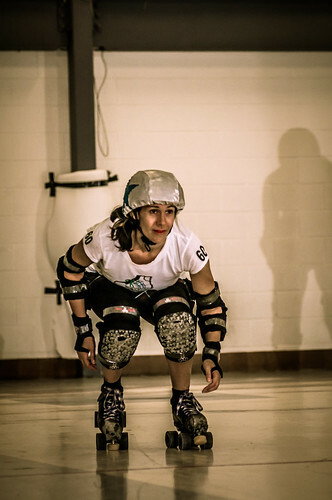 I felt connected to the girls despite having nothing, other than a desire to play roller derby, in common with them. I love the way the game is played—one can be as aggressive as one likes or not at all. After my motorcycle accident last year, I realized that I am not as big of a baby as I thought. The risk of injury, although a factor, did not deter me. The intellectual component of the game—designing and deciphering different strategies interests me. One day, I am going to be a spectacular pivot! erby reminds me of when I was 12 years old at Wheelies Roller Rink in Peterborough. I feel young and vibrant and connected to my team mates. I also appreciate that there is plenty of opportunity for players of every level and motivation. Players who are athletic and competitive have their teams and for dilettantes like me who like their recreational leagues, we have our teams, too. I want to be the kind of player that the opposing team dreads when they see my name on the roster. 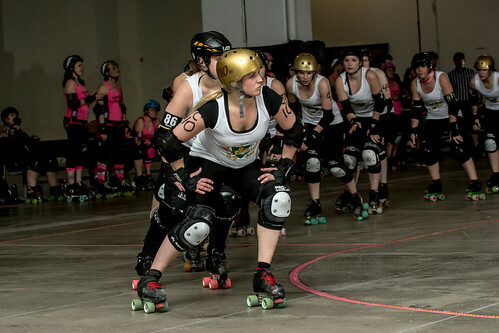 I want to be a tough, fair competitor that plays spectacular derby. I want to play clean—I never want to be in the penalty box. I think that a being a good, decent player is the highest compliment that one can give another player. 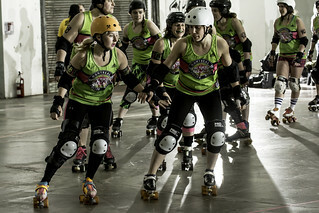 The sisterhood of derby, the pure joy of skating, and even the spectacle of watching—I believe there are more unlikely derby girls than there are typical ones because we are all unique. 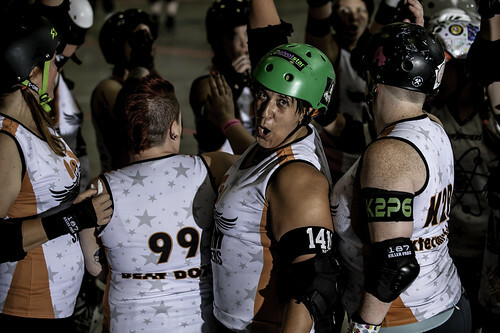 I love that we have a sport that allows us all to express our individuality and still play as a team. Outro from editor: For the event in Peterborough, we took advice from masters of the outdoor and night derby shoot in San Diego CA, British Columbia and Ontario. Their words served well, as all pretense of light disappeared into black night and the bare glimmer of night lighting. Travelling lightly meant no stands, bringing in clamps and finding the handy chainlink fence. Lighting one corner and hoping the action would happen there. We are very happy with the results and feel fortunate to have the chance to see all the ladies in the night. Thank you Tan-Her for providing the opportunity.